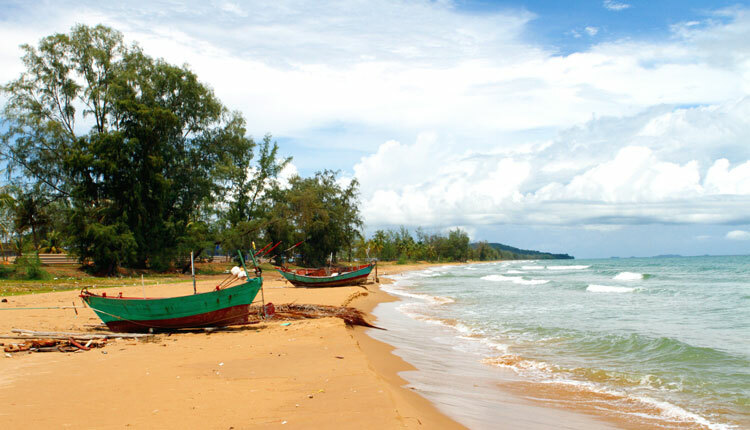 Long Beach on Phu Quoc Island is, as the name already suggests, long. Over 19 kilometers of powdery sand along the west coast offer the perfect location for most of the best beach resorts on Phu Quoc Island. Although Long Beach is the most frequented beach on the island, the stretches between the resorts are relatively quiet and depending where you are, you can get a massage right there on the spot. Another thing Long Beach, or Bai Truong in Vietnamese, is famous for, are the colorful sunsets. In the high season of tourism on Phu Quoc Island beach vendors sell their wares and services to tourists. Cold drinks, fresh coconuts, food and even massage service gets offered on Long Beach. Long Beach is approximately 10 minutes away from Phu Quoc International Airport and features golden sand, swaying coconut palms and clear water. At least during dry season. During rainy season the wind blows from the west and a glance at the sea water shows that all the millions of plastic bags that get wasted in the countries around the Gulf of Thailand every day teamed up with tons of other trash to take revenge on their makers. Yes, Long Beach is one of the most beautiful beaches of Vietnam and no, you do not want to swim there during wet season. Technically, Long Beach is divided into two sections: Northern Long Beach and Southern Long Beach. The northern section is about five kilometers long and the epicenter of tourism and located between Eden Resort and Trang An Phu Quoc Hotel, where the rocky coast meets the sandy beach. The southern section stretches all the way down to An Thoi and is mostly abandoned. If you are searching for privacy, that’s where you find it. There is not much around, a few cows, a fishing village, building sites for new beach resorts and the inevitable flood of trash.